The Washington Post recently brought up the important annual awareness of roughly 6 million people denied voting rights due to a felony conviction. Unfortunately, they are mistaken to sum up the problem as a “disproportionate effect on blacks.” Indeed any legitimate conversation on America’s prison problem must include racial issues, however the real landscape is broader. 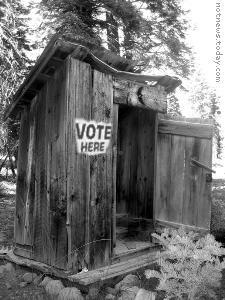 America has a history of reserving the right to vote for as small an electorate as possible. That history has been eroded by various groups over the years, while those in power have targeted new groups to exclude. The irony of recent Voter ID laws, purported to target undocumented immigrants, is that hardly any restrictions impeded immigrant voters when they were White men. And whenever I hear any mention of the Florida fiasco of 2000, I like to point out that many of the 173,000 purged voters merely had a similar name to a person convicted of a felony. If not for such a law, we may have missed the Bush II era. This issue is about citizenship and community building. Its an America issue, not just a Black one. When I was released from prison, I was no longer a citizen. I was stripped of what is universally considered the fundamental right of citizenship, as voting is the right through which all other rights are created and enforced. At 32 years old, I had never voted, never had a direct impact on governance, and (most importantly) never felt like an American citizen. I faced many other legal forms of discrimination (employment and housing, for instance) and dealt with a daily sense of ostracism. Prison was one of the few places where I felt accepted. Uniting with grassroots organizers was my only pathway to citizenship. Along with members of Direct Action for Rights and Equality and others, we wrote our own constitutional amendment in Rhode Island, got it on the ballot, and took the question to the people. We spoke with thousands of voters, many of whom meekly shared that someone in their own family was disenfranchised; someone who they would encourage to be part of the community rather than pushed away into the shadows where crime and addiction thrive. Over the past two generations, Rhode Island has issued 250,000 unique prison ID numbers. That is 25% of the state’s population. The Bureau of Justice Statistics count 79 million people in state conviction databases. That is nearly a third of all the adults in America. I won my own right to vote in Rhode Island, but then lost it again when crossing state lines to attend law school. Naturally, it only took me a few weeks to discover the strange legal basis for losing my voting rights. After a year I had compiled a massive research paper on the racial history of felon disenfranchisement in Louisiana. Yet, the racist intent of the Post-Reconstruction Era is what took my citizenship away yet again. Until 1900, I would have had no problem voting, as I am White. Naturally, Louisiana’s power elite were not unique. Just as free labor, aka slavery, creates massive profits- so too does the cheap labor of destabilized and incarcerated communities. I always drop it on them, but I like to lure them in first. I am very much a part of helping the community, have a law degree, pay taxes… but have been stripped of my citizenship. They give me a look of confusion, typically, and then a sense that I am wasting their time (as they are trying to get votes). Its like when you are talking to someone and thinking how amazing they are, and you want to ask them on a date, and just as you’re getting up the courage- they mention their partner and all of a sudden the only thing you hear is “blah, blah, blahhh…” Dropping the “F-Bomb” on a politician generally makes them go numb. The racial impact is very real, but all people with felony convictions have an intense disproportionate impact on working class communities. My daughter may grow up to identify as Latina, White, Black, or Other, but that is irrelevant to my involvement on issues like education, health care, and public safety. Like any parent, I want our community to be a safe and healthy space where she can feel a sense of belonging. I don’t want her to feel like it is best to abandon ship or, like her Dad, feel like nobody wants her around. Some have always prospered on the backs of others. It isn’t necessarily a race thing, but racism is an important ingredient to keeping that dynamic alive. Racism is an implicit justification for unjust enrichment, not the other way around. It serves to justify Voter ID laws as well as felon disenfranchisement, especially where the voice of racism has become a steady soft whisper, rather than the sharp staccato of a bullhorn. These sentiments spurred such laws’ creation and keep the unspoken justifications alive; but to measure the impacts on American democracy solely by racial impact only serves to reinforce the racist rationale. States have no authority to take away someone’s citizenship, but that is what felon disenfranchisement does. Creating a large class of “other” people does nothing but divide and weaken us all. 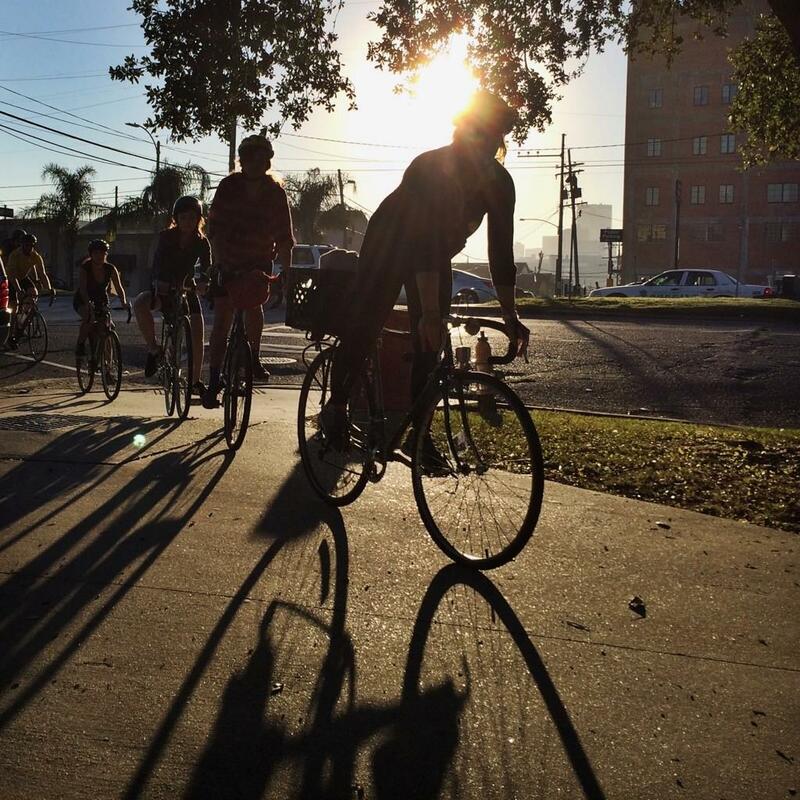 Four years ago, a few activists had a great idea: A 170 mile bike ride fundraiser that brings attention to the distance families travel, from New Orleans to the Louisiana State Penitentiary. “NOLA to Angola” has since raised tens of thousands of dollars for the Cornerstone Bus Project, who provide free monthly buses for families to visit their incarcerated loved ones. I was able to be part of the mission. And damn do my legs still hurt. I had no idea what to expect physically, emotionally, or spiritually; so like most everything, I entered with a Buddhist “Don’t know” mind of adventure. I barely knew a few of the forty riders and support people, but was inspired that they could come together for this cause. Each rider was expected to raise at least $250, with some raising over $1000 each from their own friends, families, and colleagues. Several of my donors were locked up before and deeply understand the power of a visit (or a “V-Wop,” in Joint vocabulary). The ride was full of some very deep conversations while pedaling along, particularly during the less treacherous moments where the road allowed me to ride beside someone. Most people had no idea who I was, the work I do, or my previous stint in a cage, and I felt blessed to hear about their interest in supporting this cause while sharing with them some of my experience and analysis of the System. Yes indeed, there were a whole lot of cool people embarking on such a ride, coming from all walks of life. And if anyone ever needed an inspiration to keep pedaling, 11-year old Gabe just kept going and going and going. Sometimes, particularly on the third day when I went hard along the last ten miles, I was deeply reminded of millions of folks on the Inside and millions of miles being jogged along worn down gravel tracks in hundreds of prison yards around the country. I recalled my own miles, thousands at least, I logged in prison; and I wasn’t even a “runner” like some of the other guys. I would prefer a sport, with a ball a strategy and a score, but sometimes it was just you and another guy having a jogging conversation for two hours until “Yard is closed!” drones over the loudspeaker. Other times it would be just me, recounting my things to do, thinking through a court case I’m working on, thinking about all my failures and pondering my dreams, and then hitting that blank meditation with eyes twenty feet in front of me on the gravel… just running. I knew that while we biked to Angola, there are so many people running along barbed wire in gray sweatsuits doing just about the same. I never got too many visits during my time in The Joint. Perhaps about five times a year over my twelve years. I might have used the phone about one time each week. For me it was the letters, and was blessed to have some deep thinkers in my life over that time who were not bound to text messages and Facebook for all their communications. Regardless of their intentions, people who wrote me ultimately wrote to a circle of guys. In the same vein, people who visited my circle were visiting me as well. Whether it was Rhino’s mom, Stiblock’s ladyfriend, or whoever; those guys bring the joy (and pain) back to the block for all of us to indulge. It is “life,” the real world, connecting back into this Faustian nightmare people must live in a prison. The ride culminated in an optional entry to the Angola Prison Rodeo and hobbycraft fair. For the past three years I have been asked how I feel about the Rodeo, as for Louisiana it is as much a part of the culture as Thanksgiving in Plymoth, Massachusetts. (Side Note: There is an annual protest to the centuries of American genocide that followed the landing of Pilgrims at Plymoth Rock.) I vaguely recalled the Richard Pryor and Gene Wilder movie “Stir Crazy,” when they get framed for a bank robbery and end up in the rodeo; but that was as much knowledge I had on the subject. Three years of listening to others, while imagining myself as an Angola cage-occupier, informed my opinion as I traversed the gates onto the plantation. I shared with the fellas a bit about my story, going from prison to activist-writer to law school. I like to see their eyes light up, particularly as I know how it would have felt if I had met someone like that while locked up. It can be difficult to gain inspiration in prison, and hope is a scarce commodity. As much as I read from Mandela, Hugo and Dostoevski, or about the cases of Peltier and the Angola 3, there was always a separation; particularly as some of us, many of us, actually did something terrible. We are trying to transform our own lives. Political prisoners, including the wrongfully convicted, are engaged in a different struggle, both internally and with the world. So to the degree that their struggles are useful, we take it- but there is a whole other conversation happening in the shadows among those of us striving for redemption in the mirror. One of my favorite conversations was with a man getting out in six months or so, and headed back to New Orleans after fifteen years. He too knew Norris well, and was hoping to move into the new halfway house pushed onto the scene by Norris and our friend Calvin Duncan- both former Angola law clerks, both reaching back to help the fellas they served time with. Just so happens both were wrongfully convicted by a system that does that too often; a system deeply resistant to looking at its own flaws. The man I spoke with furthered his horticulture skills and certificates while at Angola, and Matt provided further inspiration by explaining his own job: a gardening instructor for youth. I snuck into that rodeo, of course. Rather funny, when you think about it. I walked around the ring and saw so many family members and bona fide rodeo folks with their gear on. The event started with all the participants (the guys in prison) circling up for a prayer. They held hands, young and old, Black and White, and I saw too that the crowd took it serious: this is a dangerous sport and nobody wishes for injuries. We see this comradery in football and mixed martial arts where even the person who injures an opponent will ultimately hold their hand and say a prayer. When the Angola Rough Riders stormed into the ring, I could see the pride in their horsemanship (if that’s the word). When the man who sang the national anthem, and the two guys flanking him with sign language, let it rip: I could feel the preparation they put into this performance. The dude had some pipes in his lungs. There is a lot going into this rodeo, but of course it’s all about the brutality to most folks. Of course it is brutal. Our football league in prison was supposed to be flag football, but there was this little rule that if a man was knocked down he was down. Thus, although you couldn’t wrap someone up and tackle them, you could blast them into a thousand pieces. Or try, at least. Broken bones were relatively common. I went out there every week with my long hair, fast legs, and crazy beard of the month. I was one of the smallest people on the field, playing wide receiver and cornerback, and my attitude was “bring it.” If there were a crowd paying admission to the prison, to be entertained by us, I would have further enjoyed the game. I was even proud to go to the Hole because I used a contraband Sharpie to convert a normal t-shirt into a deluxe Pittsburgh Steelers football jersey. Whatever joy the prison workers took in sending me to solitary was worth it for that moment of showing off to my Brothers- to be alive. 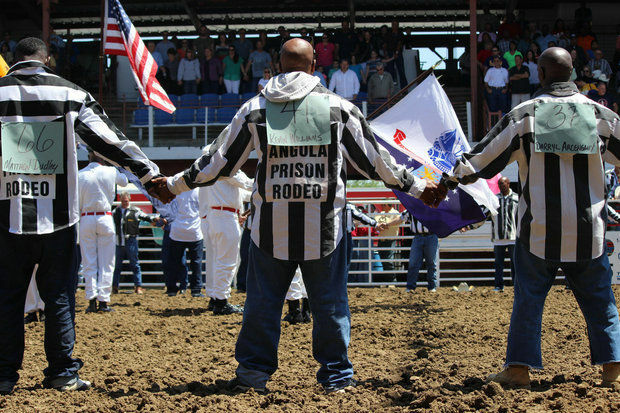 The Angola Prison Rodeo, to me, is like Field Day in elementary school. It’s the days to be anticipated, to break up the doldrums, to prove one’s toughness, see the world, and even make some money. It is true that the penitentiary exploits the guys Inside. Just like prison labor is often at least as exploitive as a sweatshop in a Third World nation. But that prison labor is also my friend’s job, and it may be the only thing he or she looks forward to all day. It provides their meager income for soap and stamps and snacks. It may also be a chance to work with animals or plants, and connect with something that feels more alive than three hots and a cot in their 5 x 8 of concrete and steel. And how many of our nation’s 2.4 million people in prison get anything to replace that? 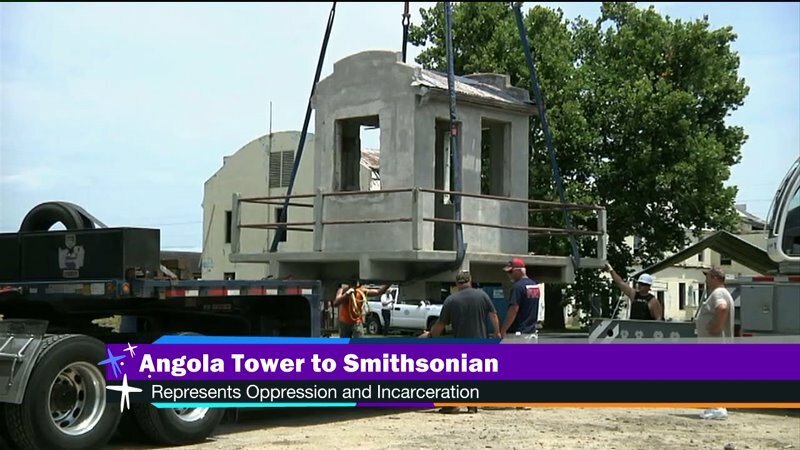 The other banner is a proud celebration that an Angola guard tower and prison cell have been donated to the Smithsonian’s National Museum of African American History and Culture. I tried to think of a parallel. Does a Jewish cultural museum have gas chambers? Do Native American museums have small-pox infested blankets? Do women’s museums have a portrait of Stanley Kowalski? The lineage of slavery to convict leasing to a targeted drug prohibition are alive and well today. To consider prisons as “history” is to pretend that we have moved beyond this inhumane system of cages. To call prison “African American culture” as if it is the fifth element of Hip Hop is a sad acceptance of contemporary oppression that instead needs to be confronted and overcome. Public figures occasionally provide us with an opportunity to engage in issues that touch us all. The NFL is the most watched television show in America, generating billions of dollars, heroic moments, and an entire subculture of interest. Now they are showing us how employers react to violence in the spotlight, and needless to say it is not a graceful display. Several things are troubling about the reaction of America. First, the focus of this violence is on Black men as perpetrators, and secondly, the suggestion that employers should act quickly and permanently ban people for criminal behavior. Numerous columns and comments arise that speak to these two points, thus it is time for some counterpoints. Ray Rice, Adrian Peterson, and Brandon Marshall are all Black men. In America, they are easy targets. 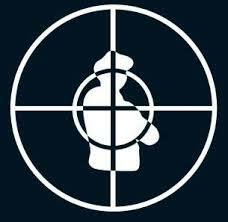 When Chuck D and Public Enemy created their logo in 1986, of a Black man in the crosshairs, they artistically reflected history. The cynic at the time would have anticipated Rodney King, Amadou Diallo, Oscar Grant, Trayvon Martin, Mike Brown and so many others. The narrative since the days of slavery has always been that Black people are overly violent, thus necessitating the violent treatment of them to keep them in line. Of course as any anthropologist, psychologist, or pet owner knows: if you treat someone violently, chain them, cage them, they are going to naturally want to escape. So if the historical oppression of Black people (by White people and the government forces) is cause for the historical backlash of Black people, what are White folks’ rationales? White people have been extremely violent in the governmental context (if we put a skin tone to the people who enforced slavery) fought back against Reconstruction, fought (and murdered) the Civil Rights movement, and staff our over-militarized domestic police forces. And that is not even getting into foreign policy. If the image of a drug dealing gun-toting thug were not enough, now Black men are allowed to carry the banner for domestic violence as well. Although the White drug dealers of the world, including the real heavyweights who earn millions, are benefitting by the mischaracterization of drugs as a Black issue… the White* women and children of America gain no solace in their abuse if we paint this as a character flaw inherent in Black men. (*Mixed couples aside). As a society we have long gone for the easy answers, such as violence being caused by inherently evil people. Just root that out, or keep them in check, and mission accomplished. It is not that simple, which is why simpletons can’t be in charge of solving these problems. The movement, and civil structures, that arose in the 1970s and 1980s to stop spousal and child abuse did not come as a response to violent Black men. Domestic violence support services are not overwhelmingly staffed by and servicing Black women (although they are, and should be). Lets get real. The historical dilemma of domestic violence is that wives were not coming forward, unwilling to be possible pariahs in their social circle and subjecting their families to turmoil. The father could be arrested, lose his job, and not be able to support the wife or children. Even worse, she wouldn’t be believed in a patriarchal society of male police officers and judges (similar to the disbelief given Black accusers of White violence). The courage to say “Enough!” and shatter an intolerable family demands support, no matter what color are people’s skin tones or where they live. Studying who calls the police, or who goes to jail, does not give us statistics on who are the victims and perpetrators; it only tells us who calls the police and who goes to jail. The women who feel stuck behind the Wall of Silence need support. If they are White, this latest public iteration of the problem may keep them behind the Wall if they don’t have a Black partner, i.e. an “acceptable” abuser. The more we portray crime and violence in racial terms, the more people inherently support a more punitive response. Focusing solely on the effects of social problems by arresting and punishing someone does very little in addressing, and preventing, the causes. I’m here to tell you: the cause of domestic violence in America is not the existence of Black men within our borders. Many Americans have put a great deal of energy into reducing the employment discrimination of people with criminal histories. 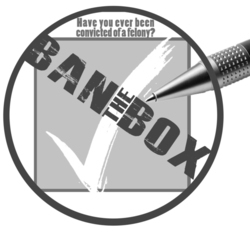 We call it “Ban the Box,” a phrase coined by All of Us or None and referencing the job application box asking, “Have you ever been convicted of a felony?” Over the past few decades we have made considerable progress in changing municipal policies, state laws, and the Equal Employment Opportunity Commission’s official federal guidelines on civil rights enforcement. The brouhaha of the NFL threatens to undo decades of cultural education and policy development. The Baltimore Ravens and Minnesota Vikings have learned that “the customer is always right.” Their fans and sponsors have spoken: don’t take domestic violence lightly. When the Ravens chose to wait and see what the League investigation revealed, and how the criminal charges played out, the fans were okay with Ray Rice losing about $500,000 from a two-game suspension. And then came the graphic video. People were stunned, that this video could generate that response. The Vikings have almost learned this lesson, and every team is likely scrambling with how to handle one of their employees doing something similar. The New England Patriots at least had the help of the court system, as the state held Aaron Hernandez without bail pending his trial for murder. 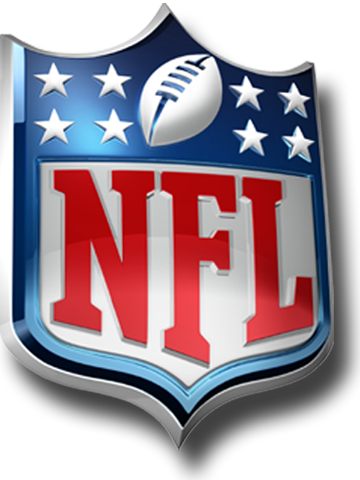 In the NFL, players can legally only be subject to sanctions by their team or the League. Not both. Thus, a team needs to play it wisely from the time of the event, as their whole profit model is based on likeability (and winning). Selling stuff with the logo is how they rake it in, and I have two jerseys, a mug, floor mats, a decal… and a slew of brainwashing items for my five-year-old daughter. If Troy Polamalu ever saw my little one in her customized Kiramalu jersey he would want to do a shampoo commercial with her. But who is putting an Adrian Peterson jersey on their kid now? Most business are not on TV with a fleet of journalists and its own channel. Most employers will not be expected by their customers to take action immediately after an arrest, and should be able to continue employing someone while the judicial system runs its course. The Pittsburgh Steelers recently had their top two running backs arrested for marijuana on the brink of the season. Many wondered what would happen to the team if suddenly they were both suspended for several games. The team chose to punish them internally, with no details yet released. Obviously the team’s ability to “get away” with this response, and also allow the judicial system to run its course, reflects America’s views of marijuana at this time. We have far less tolerance for domestic violence. Most employees (99.9%?) will not have earned millions of dollars prior to an allegation, arrest or conviction. Feeling consequences for one’s actions is an overwhelmingly accepted concept, whether it is through the criminal or economic system. So we should be careful not to draw too many lessons from these public figures being in the spotlight and how best to handle them. The rest of America needs to keep supporting families, and if they have consequences to pay, need to be able to rebuild their lives rather than be eternal pariahs. We don’t see a lineup of White Wall Street executives on the Bloomberg Channel being paraded around for some alleged (or actual) domestic violence or drug use. We see wealthy Black men, talented in their field, and anomalies to the rest of us. Yes, take this opportunity to discuss these issues as it relates to us… but pointing the finger is not a method of dealing with our own problems. Oh, the discomfort created by calling the police “racist,” after yet another slaying of people such as Eric Garner, Michael Brown and John Crawford. Some articles will provide the lists and reports that evoke the pattern of young Black men and boys. The list extends to White people and Black women as well, yet the pattern becomes abundantly clear. The discomfort should not begin with calling government employees racist, it should begin with those government employees killing our neighbors while walking home or shopping at WalMart. Those officers wear badges that give them the legitimacy of their entire town. If someone can think of other systemic motivations other than racism that drive the shootings of so many unarmed Black boys and men, then everyone should be calling it out and rising up against it. We don’t see politicians leading marches for lack of training in their own police departments, or lack of mental health screening in their hiring practices, or demilitarizing their police forces. Instead the target communities are left on their own to respond, while many leaders will ask for “calm. Business owners traditionally bear the brunt of community-wide frustration, thus positive police-community relations are in their best interest. In the larger picture, however, destruction of property becomes a less-violent method of blowing off steam amongst those calling for not only justice, but also revenge. Combustible material only needs a spark. Just like 9/11 sparked a multi-trillion dollar global combat and imperial initiative, Rodney King’s videotaped beating became merely the first (and Garner/Brown/Crawford the latest) spark for Americans to push back against domestic police violence. Will we see organized actions at the homes of police chiefs in Staten Island, NY, Ferguson, Missouri, or Beavercreek, Ohio? 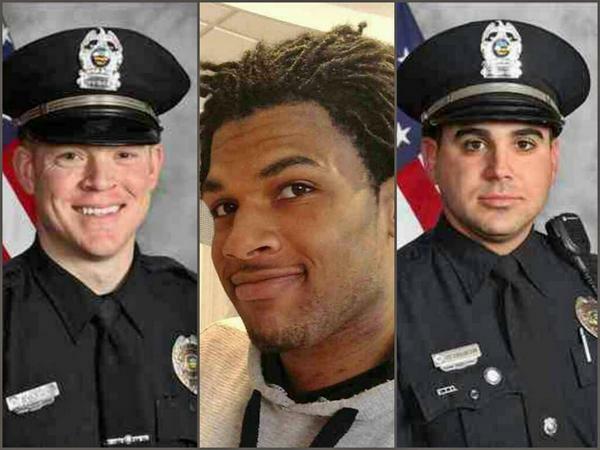 Will the candlelight vigils be conducted while surrounding the police departments? There are many ways to demand change, and the hack-tivist group “Anonymous” has vowed to get involved. Ultimately, we all need to do something. 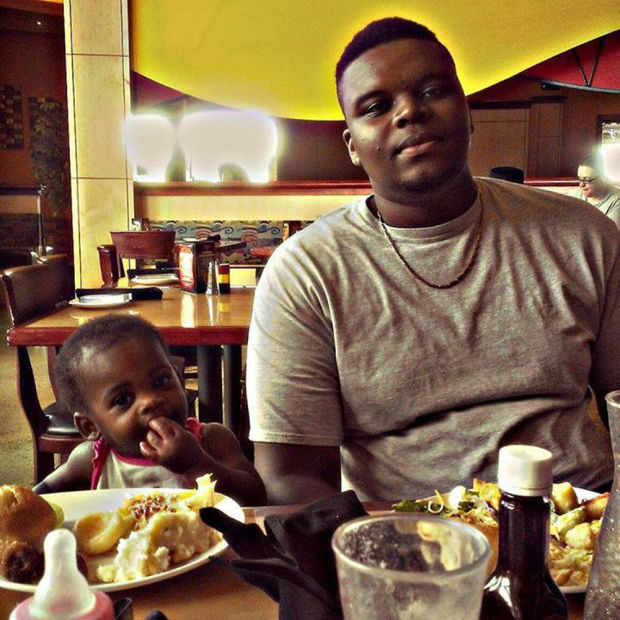 In Ferguson, Mike Brown did what anyone should do when facing an apparently crazy man with a gun: he ran. The officer apparently tracked him down and finished the job. The aftermath is almost as troubling, where the police respond to civil unrest with military force rather than employing a strategy of de-escalation. Police refuse to report the name of the shooter. In Staten Island, the police could not handle a man doing no more than children at a lemonade stand. 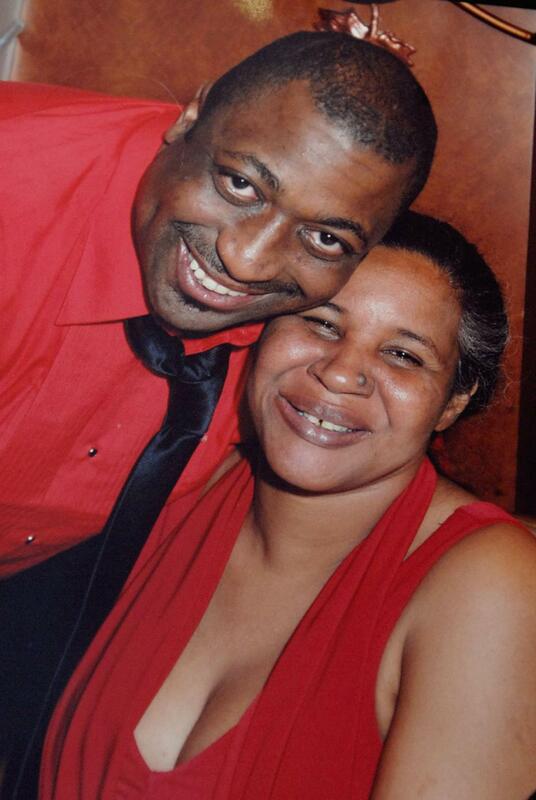 Eric Garner was selling single cigarettes without a storefront or any sort of vendor’s license, and the disturbing video should make anyone uncomfortable that this could be a government response to such a “crime.” Officer Daniel Pantaleo is suspended without his gun, while another officer and four EMT’s (who hardly responded) were suspended without pay. In Beaverton, John Crawford was holding a BB gun, readily available in the BB gun aisle, at WalMart. He was on the phone with his partner, and mother of his children, when she heard him say “it’s not real,” and then Sgt. David Darkow and Officer Sean Williams opened fire. They are on administrative leave. A woman running from the scene also collapsed and died. It is likely that the in-store cameras will shed a bit more light on the story, and it is ridiculous that the Walton Family has not quickly ordered that the video be provided to Crawford’s family. Will the world of video force massive changes in how we deploy police in the community? Or will it make us all numb to overt violent control? Communities are already demanding officers wear cameras at all times, with strict liability for whenever the camera mysteriously doesn’t work. With today’s technology, we can stream the video of every officer back to a control panel and database. Knowing you’re being watched, knowing you need to be on your best behavior, works for everyone whether they are wearing a badge or not. The most important thing to remember when lionizing or demonizing police officers is that they are just regular people, flaws and all. But we invest in them to be less-flawed, and skilled in conflict resolution. Our media, politicians, and society are very effective at ostracizing and punishing people who never wore a badge; it is amazing how much they all struggle once someone takes a job with the government and does similar things. What those defenders need to know is that they are creating a “side” in this scenario, and only reinforcing the beliefs that there is a dominant group who doesn’t care if Black people are murdered. Reinforce a belief enough, and it simply becomes the truth. Its not just what prison does to us. It’s You. Recently reading a scholarly article regarding the negative impacts of prison conditions on people made me think about what really holds people back after we get out of prison. The article focuses on the inhumanity and brutality of prisons, how we are kept apart from families and love while thrown into this lion’s den to survive among gladiators. The mental illness spawned from spending hours and days and weeks and longer in solitary confinement, with nothing other than a wall and (maybe) a Bible. The health care, unhealthy food, fear, hate, and all that which truly exists. But that is not even the main thing. When we get out, many of us are reborn. The sun shines on our face in a new way, we start over, we feel blessed. We want to believe we survived the punishment and it has come to an end. But that is naive and foolish, as this is where the next phase begins. After prison we enter a world where we are pariahs. We are distrusted and hated and, at best, tolerated as long as we stay on our side of the street. Some of us may be able to put on a suit or walk down the street undetected, but as soon as anything of consequence happens, like a job application, housing application, voting, or dating situation, we are found out. In prison we are at least equal members of a society. There is a societal structure and internal outcasts, of course, but the majority of us are average “citizens” behind bars. We are unprepared for the negativity. People have their personal opinions, and so too do the laws that enforce our lifetime of punishment. Those of us who did a long time in prison, who think we completed a lifetime dosage of suffering, come out to a world of new walls. Those of us who did short stints for petty offenses face this shunning as well. Would you hire a person who had been in prison- and for what crimes could they be convicted? Would you live with someone with a criminal record- and how long would you want them to have been out? Would you let us sit on the nice furniture at home? Would you allow us to marry your child? I won’t speak for all formerly incarcerated people, but the affects of prison life don’t impact me in free society. What holds me back are the people who fear me. I get it. I’m not even going to judge it- I never have. I’m just calling it like it is. What an amazing year to be part of the Class of 2014. 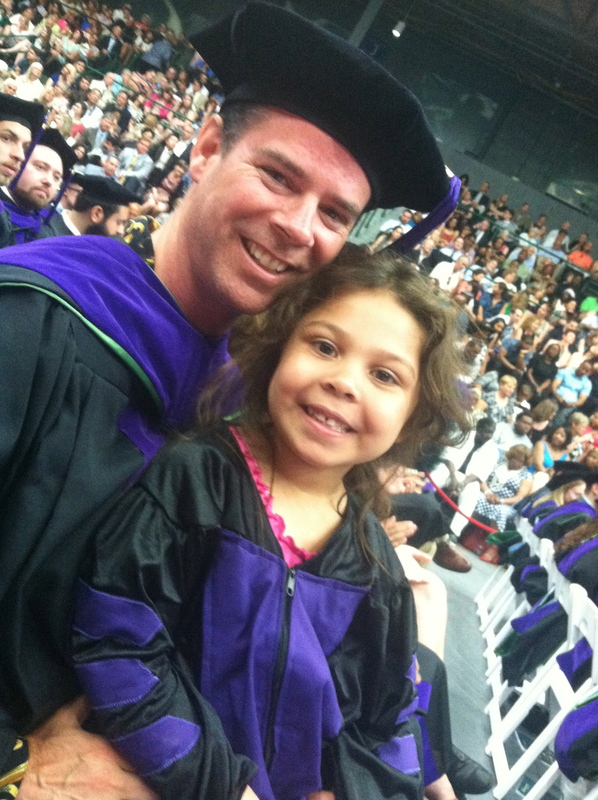 In Seattle, Shon Hopwood graduated from the University of Washington School of Law. 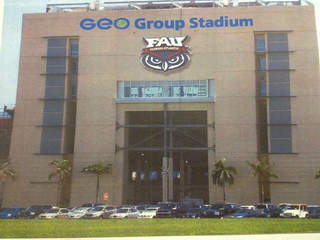 In Miami, Desmond Meade graduated from Florida International University College of Law. In New York, Marty Tankleff graduated from Touro Law Center. 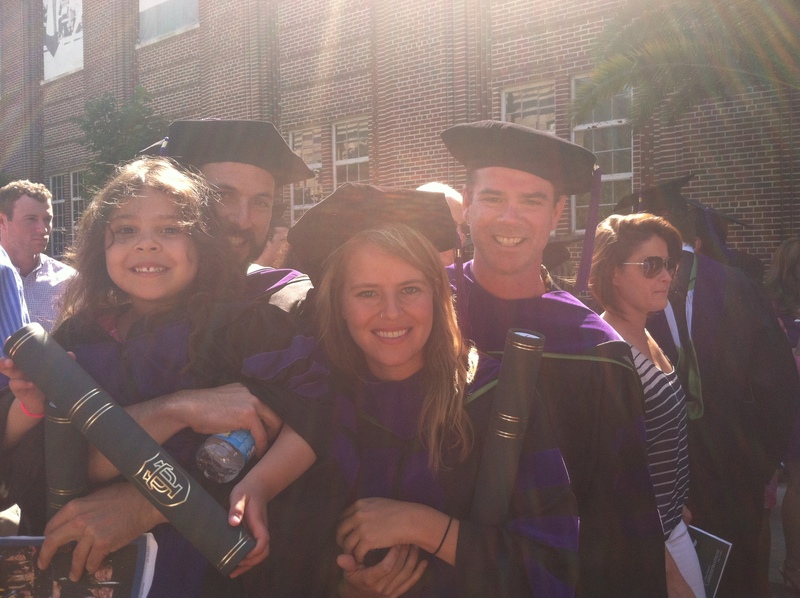 Their achievements help me put my own degree from Tulane University Law School in perspective. We collectively represent over forty-two years in prison, in cages to be more accurate, and now hold certification that we “officially” understand the fundamentals of the American legal system. We aren’t the first people to go from being subjected to the law to ultimately navigate its corridors. The list is long and varied, every one unique, and each showing the diverse paths into (and out of) the most miserable space one could be stuck inside. These people, all public with their pasts, include Dan Manville (Antioch ’81), Chris Ochoa (U. Wisconsin ’06), Daryl Atkinson (St. Thomas ’07), Andres Idarraga (Yale, ’11), Noah Kilroy (Roger Williams, ’13), and soon to include Jarrett Adams (Loyola-Chicago, ’15) and Pete Martell (Wayne State ’16). Some were proven innocent (Tankleff, Ochoa, Adams), but for much of their lives they were not treated as such. Many of us were practicing law while in prison as Jailhouse Lawyers, which is why I say we “officially” joined the ranks of those with a Juris Doctorate degree. I filed my first bail motion and memorandum when some of my classmates were in kindergarten and have over two decades of experience covering all aspects of the courts and prisons. A guy in prison once told me that after I got out and made my millions of dollars, I would forget all about the past and people like him. After graduating last weekend, the guy’s point about staying grounded and not losing touch is as important as ever. Of course, I need not try hard to be reminded about who I am and where I come from. My life is overwhelmingly intertwined with the criminal justice system, and the people struggling to create healthier responses to social ills. We can’t cage everyone without a home or a job, we can’t lock up addiction, nor will a military-grade police force stop anger, greed, depression, and insanity. Last week, I was reviewing scholarship applications for Transcending Through Education Foundation (TTEF). All of the applicants are currently incarcerated, and over half of them are teenagers trying to get some funding for a college education. One essay that truly left an impact upon me spoke about the success of getting rid of every “friend.” In his environment, all his peers were forging a negative path and success was to be entirely alone. Tragic, yet real. I want to share with him there are more levels for him to achieve. We need to empty the container, wash it out, and refill with something pure. Prison can serve this purpose and, as they say: “you know who your friends are when you go to prison.” Friends have been essential to my journey, including those from before, during, and after prison. Who can imagine writing someone for over a decade with no guarantee to ever see each other in the free world again? Who is bold and hopeful enough to talk about college educations, business proposals, and families from cage to cage? Who is strong enough to stand by you when their loved ones are begging them to stay away? Friends are. Bruce with Andres Idarraga (L), Norris Henderson (R), and Kira Love. People who have been in prison face all sorts of hurdles, regardless of whether they are “deserved” or not. I applied to over thirty law schools. One Dean of Admissions met me at a forum in New York City: Susan Krinsky. She was the only person willing to put her neck on the line and admit me. Every other school declined. As the negative media would later play out, about a “convicted murderer in law school,” her courage should never be forgotten. The vaunted NAACP Legal Defense and Education Fund (NAACP-LDF), founded by none other than Thurgood Marshall, also made a decision to accept me into their family, and that too has been an honor. Similarly, two professors at Tulane (Jancy Hoeffel and Katherine Mattes) helped me through those early months of adversity along with dozens of amazing new friends who were also just trying to focus on their homework. And ultimately, being part of an organization, Voice of the Ex-Offender, (VOTE) was crucial to my keeping my footing when people try their damnedest to dislodge me. We need each other, whether you have been in prison or not. I was at Andres Idarraga’s graduations from both Brown and Yale. Many states have rules barring parolees and probationers from interacting with any convicted felon. 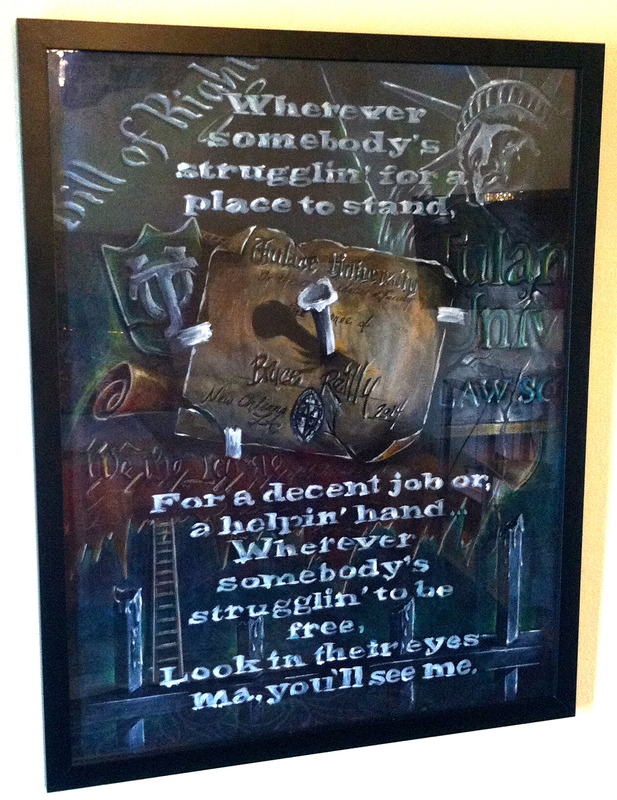 I also gave him framed artwork from an incarcerated friend, Steven Parkhurst. Last week, when I walked the aisle with my daughter, it would have been incomplete if Andres were not there, along with two other men exonerated in Louisiana, Norris Henderson and Calvin Duncan. When Andres gave me a picture Steve made for me, the tears started to flow. The journey can be overwhelming at times- both the pain and the joy of it all. Recently, an artist remarked how he was afraid that by me going to law school, the social justice community would lose me into the corporate morass of money-making lawyers. It surprised me that anyone would think this way. As Glenn Martin, another formerly incarcerated man, once told me: ‘Success isn’t when everyone gets out of prison and becomes a full-time advocate against the current criminal justice system. We need to be successful across the entire spectrum of society.’ To a certain degree, we possibly already are; but that’s because most people aren’t “Out” in their daily lives. 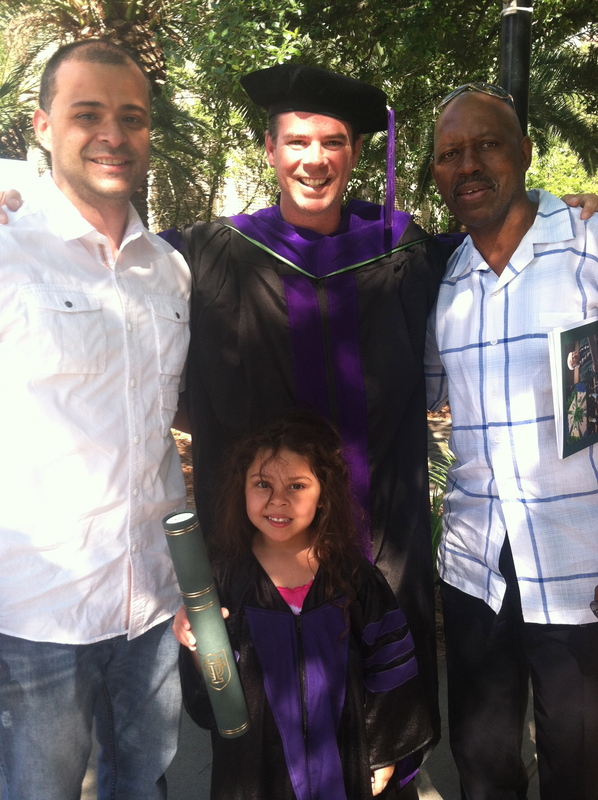 I am the last of the three TTEF founders to earn a law degree Andres in 2011 and Noah in 2013. We all came to this path from a different route and perspective. It is interesting to consider we have different ethnic backgrounds, served different stretches of time in prison, and for different crimes. 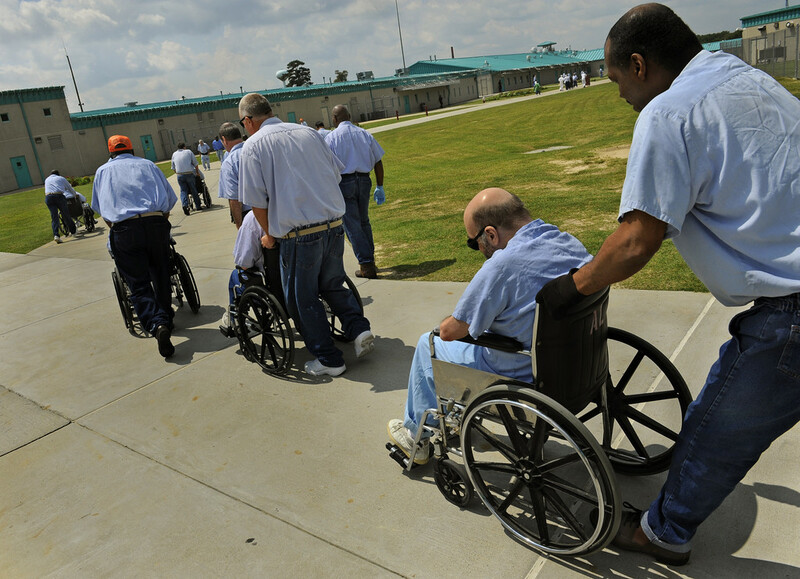 Our friendship, along with others who were incarcerated with us, serves to ground and guide our paths. My twenty years of legal advocacy started with a bail motion for another prisoner and extends to all aspects of policy change across the country. This part of my work will remain whether I open a café, launch a film production company, or work for a non-profit. In the words of Tyler Durdin, “We are not our jobs.” Our work may provide us with an opportunity to do good things, whether on the job or while off duty. Or we may need to take some stepping stones—especially for those of us not sitting on a family fortune or a vast network prepared to support an endeavor. If Jay-Z calls tomorrow and says I need you to negotiate sneaker deals for his new NBA players, that would be a gateway not a finish line. Besides, I can use a new pair of sneakers myself. Despite the headlines, only a small part of the legal realm is criminal law. I never wanted to be a criminal defense attorney (I know plenty of great ones) and there wasn’t much more for me to learn in that area. I concentrated my studies on intellectual property (copyright, patent, and trademark) and the Internet. The future of our legal system might actually be summarized by Monsanto, Net Neutrality and Edward Snowden, as we struggle to determine who and what is under control. My contributions are likely to come with projects I do in my spare time, as we are in an age of hostility towards controversial people in academia. This has been the pattern of my entire life, as I have generally paid my bills with jobs outside the legal/policy realm. I’m sure Shon, Desmond, and Marty get hit with the same question I get: “So what’s next?” I’m guessing they have better answers than myself. Shon is a published author with some highly esteemed supporters. Desmond has been a leading figure in the Florida re-enfranchisement campaign and found considerable support for his inspiring journey. 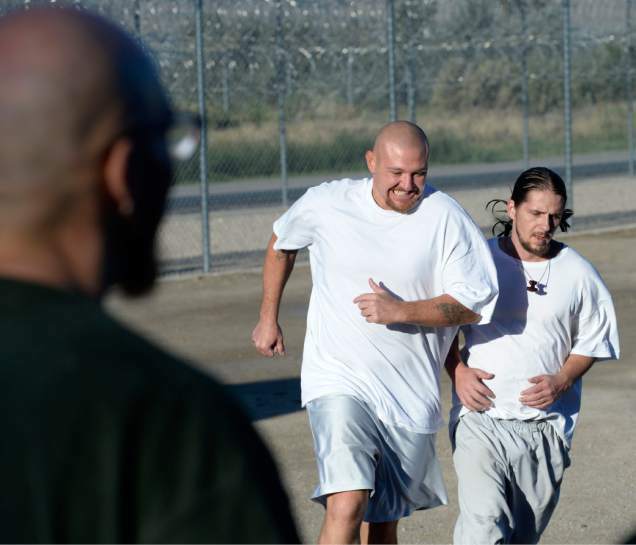 Marty now has no criminal record and is a member of the Innocence Project network. Some of us, however, have histories that are more challenging to digest. Those who only hear about the successes are simply not privy to all the rejections, and to those who simply ignore us. This is not the year for me to try taking the Bar and being a licensed attorney, for reasons I have previously written. Those who push me do not realize that it is the one aspect of my life where I am forced to be pessimistic, particularly as I am still on felony probation. That status alone would likely suspend someone’s law license until it were finished, therefore it is difficult to imagine even the most forgiving panel finding me morally fit to practice law. Those who know me will realize that I’ve only made it this far due to an undaunted diet of hope and optimism, and I would rather dream about other things. I still can’t vote in Louisiana and there are many jobs I’m legally barred from holding, but I’m used to a low percentage of success. People like us just have to try more doors and spend more time doing it. I am currently working on a book about the criminal justice system and a screenplay about wrongful convictions in New Orleans. I’m open to part-time and project work, and would like to get myself “artsy” again. I can’t speak for Shon, Desmond, and Marty but the conversation need not always be about “What’s Next” in life. Sometimes we need to pause and recognize what we just did. Who’da thunk it? Welcome to reality. And it is time for the Joneses to step up or get called out. Many of our families and circles are closed to some sort of other. For some it is race, others it is class, and oftentimes one can sense it without anyone even speaking it. 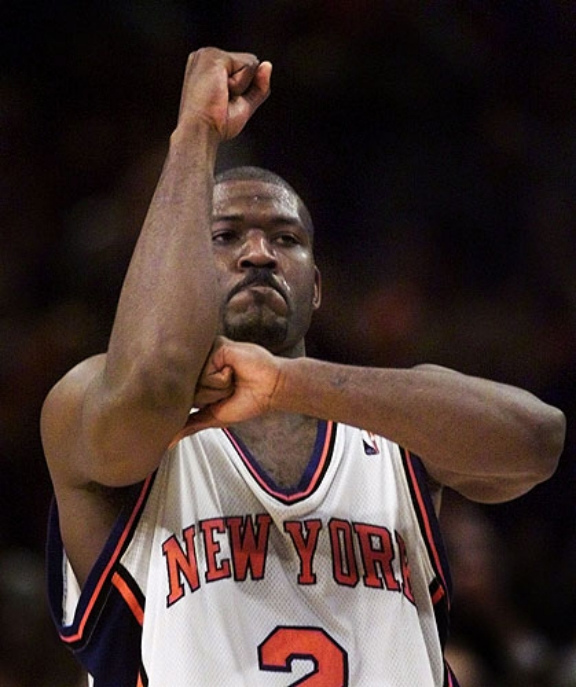 How prescient does Larry Johnson sound now when he famously referred to himself as a “slave” even though he was earning millions of dollars in the NBA. People with criminal convictions in their past are often told outright that we are not wanted. Bold signs and fine print bracket our days. Even learning that a college professor was pushed out, based on the University buckling amidst some public scrutiny of his activities decades ago (of which they were aware), makes one wonder if any of us can be accepted anywhere. We know what they say behind our backs, and know that many people can’t be seen in public with us- can’t be on the Instagram feed. Or to a certain extent. Just like the joke about the “one Black friend” required to add some color to the beer commercial or wedding photos, it must be nice to have the “one ex-con friend” for great stories at cocktail parties. But in the end, that person will never get to sleep in the main house and never marry into the family without declaring blasphemy. Mixing with our ilk is the miscegenation of our time, requiring not just love but courage and defiance to make mixed-marriages work. Some have criticized his former mistress, V. Stiviano, a Black and Mexican woman, for being a gold-digger who hung out with this guy for years. But what I like about her is the ability to simply combat his racist statements and expose him as an anachronistic idiot who has no logic appropriate for society. She didn’t need a degree in Post-Colonial Racial Conflict Theory from a fancy school. She is an example of how any of us can understand this issue and speak truth to power. Most of us impacted by the -isms have no voice, no microphone, and no money. But some do. Some will look like the discriminated folks, and others will act out of solidarity and repudiate those who express bigotry. 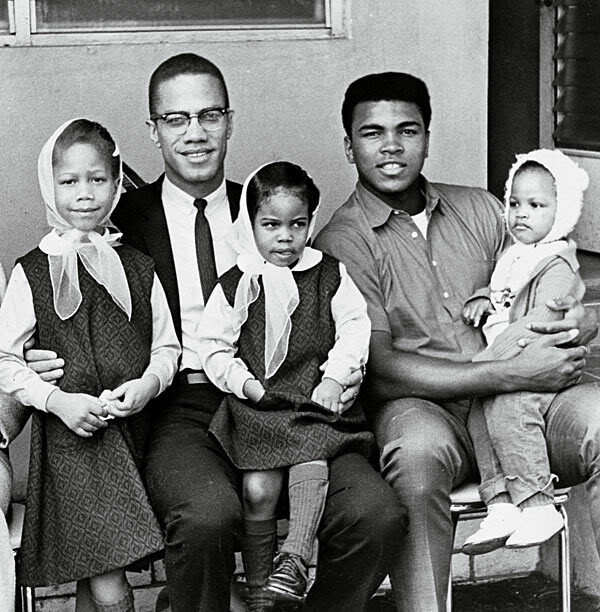 Muhammed Ali has no equal in sports, and possibly professional life, for giving up boxing in his prime because he believed that war was wrong, and an imperialist war was downright evil. In the end he was vindicated, but was despised at the time for his color, his religion, and cultural beliefs. Clippers All-Star Chris Paul is president of the NBA Players Association. 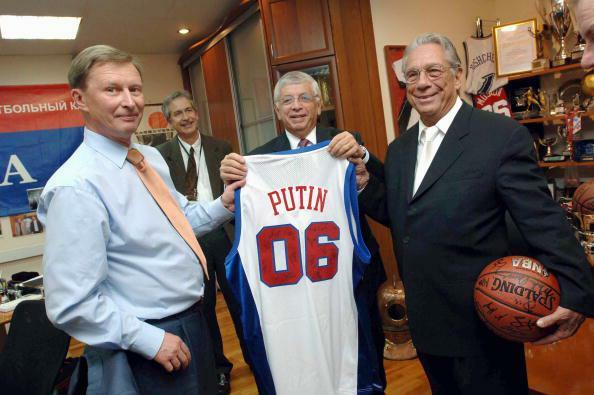 It requires far less courage to stand up to his boss, Donald Sterling, than Muhammed Ali had when standing up to American foreign policy and saying “No.” If NBA superstar Blake Griffin refused to play, he would receive accolades from most corners of the media. Many attorneys would trip over themselves to defend any lawsuit Sterling could bring regarding a Clippers player, or even a Golden State Warrior, who refuses to play. After all, Sterling said not to bring Black people to the games. 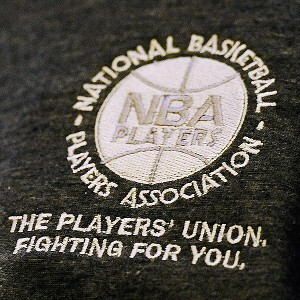 If the players’ union does nothing, they will have defeated their whole purpose of unifying: to create a balance of power with the owners. Individually, any one of them can be replaced- even Lebron James. Collectively, there is no NBA, and no income for anybody. They are each sitting on millions of dollars- millions more than 95% of America and 99% of Black America. They each have a fan base and the power of an instant press conference. The owners may indeed take collective action to eject Sterling from the league (with a 75% vote), but the players are the ones with the true stopping power. The Golden State Warriors will be in Los Angeles to face the Clippers tonight. Warriors coach Mark Jackson has called for a fan boycott, to not put any money in Sterling’s pocket. Jackson is a former NBA All Star himself, a tough dude from NYC, who could retire five times over. We shall see if that is all he has to say on the matter. Ultimately, few of us are in a morally and financially safe place to make a stand- and the rest of us pray for (or demand) them to do so.